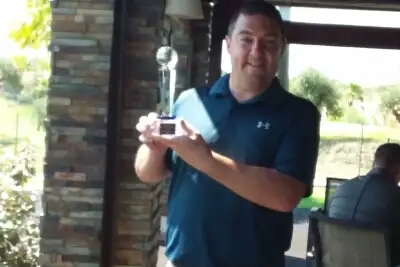 Chris Boyes 2018 Matchplay winner! 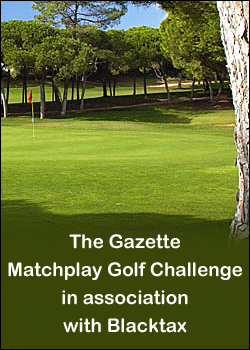 But the 30-year-old six-handicapper couldn’t have been pushed harder to complete his hat-trick of Gazette titles than he was by two St Annes Old Links players on the Algarve. Chris Nay brought the best out of the champion in an edge-of-your-seat final, which Boyes won 2 and 1 at the spectacular Vale de Pinta course, 24 hours after after clinching his semi-final on an extra hole after Mark Townsend’s dramatic fightback. This was a triumph for patience as well as consistency: Boyes won none of the final’s first 14 holes, all but one of which were halved, then reeled off three in succession to close out a match which Nay seemed destined to take to the wire after beating Steve Heyes 5 and 4 in the other semi. “What a great week,” he said. “I’ve had two really close matches – Mark and Chris both played excellently, which is what you want. “I just couldn’t win a hole in the final but kept being patient and scoring par until Chris made a mistake, which is the way I’ve played the whole tournament. “I’ve played steady golf on three courses which were new to me this week and I couldn’t be happier with how I’ve performed. Runner-up Nay, 32, added: “I’m really happy with how well I played on a course I hadn’t played before. That must be my record for pars in a round (11 of the first 13), and a birdie as well. I hit it straight and putted well but Chris is a phenomenal player. Nay needn’t have worried about that missed opportunity as he won the par-three seventh with a bogey, the first shots either player had dropped, Boyes encountering problems after an overhit drive. The 12th was the only other hole Boyes bogeyed, missing from four feet, but Nay couldn’t better this and needed his powers of recovery after hitting through the green and down a slope. The 13th could have been a turning point as Nay’s drive veered way right and was lost, though he was granted a free drop under the ground-under-repair rule. Boyes made light of the course’s most difficult test with a solid par, which Nay needed his extra shot to equal after missing a nett birdie putt from eight feet. But that’s what happened, as the champion himself said: “When I finally won one at 15, I said to myself, ‘This is it’!” Indeed it was as the three-time winner never looked back. His excellent long birdie putts on 15 and 16 finished inches away and his opponent couldn’t make tricky par putts under pressure to save. 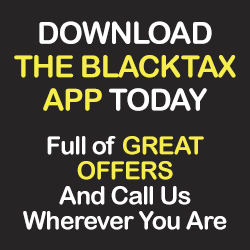 There’s plenty of great golf to reflect on as the four players look forward to a final day of leisure and luxury on the Algarve with perfect hosts and tournament organisers Ian Wharmby and Ian Hodgin of Blacktax.